Kelly and I depart Sydney about 7 am and head north on the F3 to Hexham. From here we went via Morpeth (showing Kelly where my father grew up) to Dungog. From Dungog we head north-east on the Stroud Road. About 4.4 kilometres out we turn left and a further 2 kilometres along we turn left again into Skimmings Gap Road and enter the Chichester State Forest. 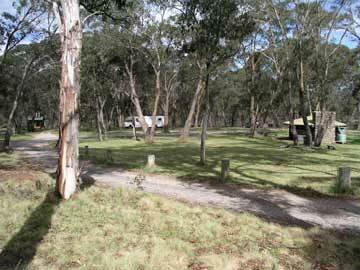 We have morning tea at Knobs Lookout which is a camp site/picnic area which has great views over the southern parts. From here we cut across to Frying Pan Road and visit the camping areas at Frying Pan Creek. There are many spots here, although I suspect that in school holidays they are all very crowded. We continue along Frying Pan Road and then take Middle Road south. 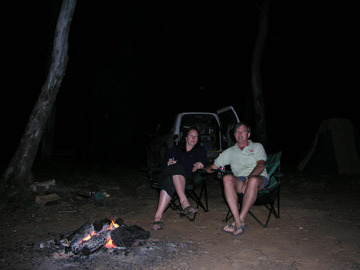 This goes to Currawong and there are a number of nice camping spots here as well. The roads we have been on are in fairly good condition and we have been averaging about 30 to 40 kmh. We stop at a spot next to a small river and have lunch. We continue on and come to an intersection with Wangat and Skimmings Gap Roads. We head down one track here but we soon turn back as it is quite rough and we are averaging only 10 kmh. We head north along Wangat Road. 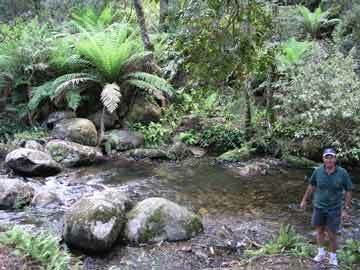 We stop at Dundungara Falls and walk down the rough track to the creek. The falls are running but there is not a huge flow of water. We continue north again till we get to Mountaineer Trail. This becomes Middle Road and we are averaging about 40 kmh. This track gets windier and windier and when it becomes Mountain Road we are down to 10 to 15 kmh. 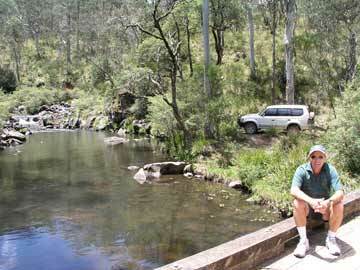 We drive across the Karuah River, really just a stream, and take a track down the left just after the river crossing. 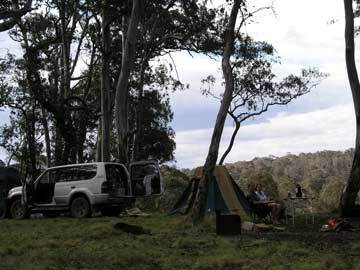 This camp spot we found mentioned in 4WD book is right on the river and is located at GPS 32° 08' 54.4"S 151° 45' 33.4"E using WGS84 as datum. As mentioned, the river here is only a few metres wide and the camp site is only big enough for two or at the most, three vehicles. A great little camping spot. We have a leisurely start and continue along the track It is now heading roughly south. When we come to the Terrible Billy Road we turn left. This is a very rough track and we average only 17 kmh till we exit the forest. It has taken us well over an hour to travel the 20 or so kilometres. Soon after leaving the state forest we come to the Bucketts Way. We turn left and head north towards Gloucester. We have morning tea on the outskirts of Stradford, a small town, at a nice picnic site. From here we went into Gloucester and after a quick stop, continue on the main road to Copeland and Barrington Tops National Park. This is a very scenic route and the road is pretty good, some of it is tar. We average about 60 kmh. At Copeland we stop for a few minutes to look at the remains of an old mining village but there is not all that much to see as it appears that the main area is closed and has been for some time. We end up turning off the main Barrington Tops Road onto Dilgry Circuit and we stop at the Banksia Camping Area for lunch. 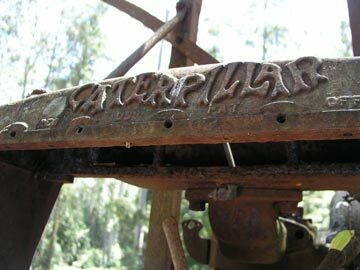 From here we go onto Thunderbolts Trail and then onto a road that leads to the Manning River. This river is the one that passes through Taree. Up here it is a stream, with the water tumbling over boulders as it starts it journey to the Pacific Ocean. At this location there is a small camping area. 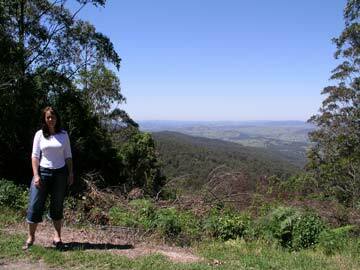 This is a very high part of New South Wales. A lot of the time you are over 1,000 metres and even get to 1,500 metres at times. We backtrack to Dilgry Circuit and turn right, this time heading north-west, west and south at various times. We turn right onto Pheasant Creek Road and then back onto Thunderbolt Trail (I do not know how some of the tracks appear here and there as they do not appear linked). 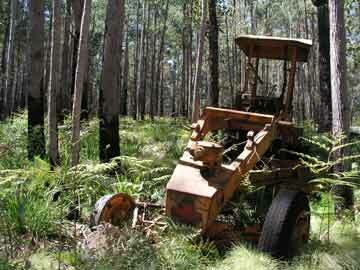 Further along we turn right into Tugalow Trail and follow this in a rough north-west direction. Along here we come to a very strange rock. Let's just say that it looks like a part of a man's anatomy! Location for the girls is GPS 31° 54' 00.6"S 151° 28' 06.8"E using WGS84 as datum. A short distance south of here we turn right onto Bullock Bush Road. For the past hour or so we have been averaging about 10 kmh. We cut across Tubrabucca Raod to Barrington Trail and head south. Along this road (where we average about 18 kmh), we hit 1,526 metres at GPS 31° 56' 09.9"S 151° 26' 38.9"E using WGS84 as datum. A bit over a kilometre south of here we come to the Barrington Tops Road and turn right. 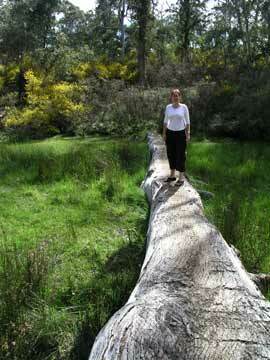 A few kilometres along we come to the Polblue Picnic Area and on the other side of the creek is Polblue Camping Area. 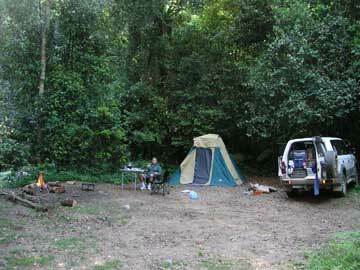 The camping area is in Barrington Tops National Park and is quite large. It is an excellent camping area. It is located at 1,450 metres, the highest I have ever camped. 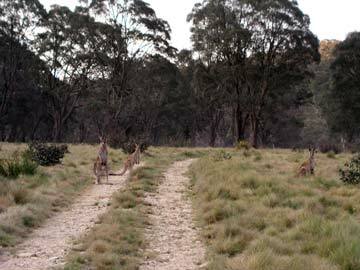 It is next to Polblue Swamp, it has lots of freshwater (a nice flowing creek) and there are plenty of kangaroos around the camping area. The facilities are very good. We stay here two nights and there were only a couple of other vehicles each night. There are some nice walks along the main road at sunset and a very good walk around the swamp. First thing when we get up we do the walk around Polblue Swamp. This is very easy and quite interesting. It is a nice start to the day. Today we decide to drive the Barrington Trail to Mount Barrington. On the way there are a number of camping areas to visit. This includes Little Murray and Junction Pools. 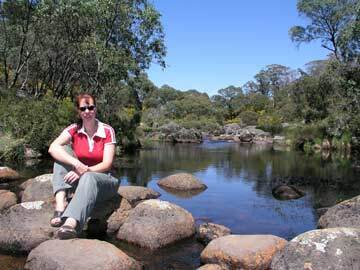 Junction Pools is a nice spot and worth looking at as the pools are quite beautiful. The camping areas are not as nice as Polblue but not too bad. Junction Pools is off the Barrington Trail. We have morning tea at Junction Pools and then head for Mount Barrington. Here the road is closed and we park and go for a walk. It is quite warm today, especially considering the altitude. We walk along the closed road for about an hour. It is a bit boring as there are no views and very little wildlife. As I mentioned, it is very hot and dry. We return back to the car and have lunch at the picnic area. There are very good views from here to the south-west. After this we decide to go west from the car park along Middle Ridge Trail that a book we have shows comes out of the park and follows a creek. This is quite a steep track and in spots, a lot of care needs to be taken. We are averaging less than 8 kmh is spots and overall, 10 kmh. After 45 minutes we come to a gate with a sign that threatens shooting (or something like that) if you enter the property. Back we go. It takes us about two hours to travel back to Polblue and it is getting dark by the time we arrive. Another great night here, it is really a nice camping spot. We leave Polblue about 8:45 am and head back up the Barrington Tops Road and then less than a kilometre along we turn left into Paddys Ridge Trail and then left into Butchers Swamp Trail. Just before the intersection with Tubrabucca Road there is a hut and at the intersection we turn left. 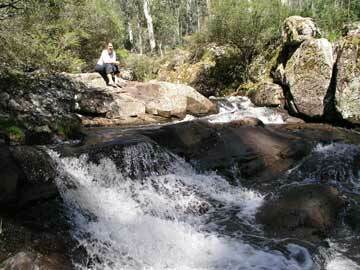 A few hundred metres along is Polblue Falls Picnic Area. 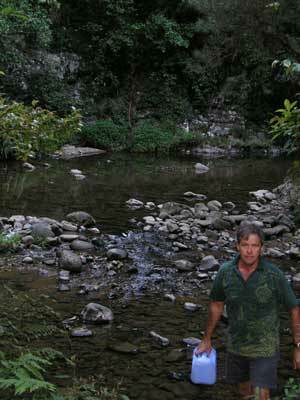 The creek here is very nice and we spend some time walking along its edge and taking photographs. We have morning tea here. 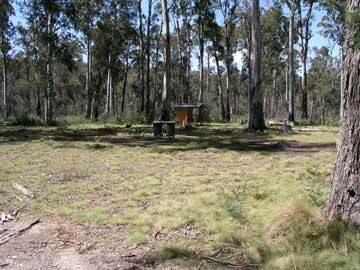 A few hundred metres along there is a turn off to the right which leads to Horse Swamp Camp which is a camping area. From memory, it was not too bad. 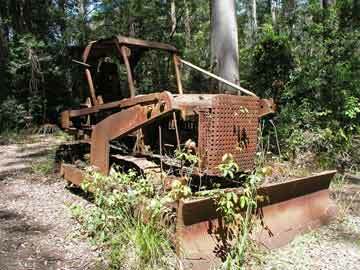 We continue on along Horse Swamp Trail and another two hundred metres along there is the wreck of an old grader on the left side of the road. A kilometre and a half along we return back to Barrington Tops Road. On the left just over a kilometre along is the Firs Picnic Area. 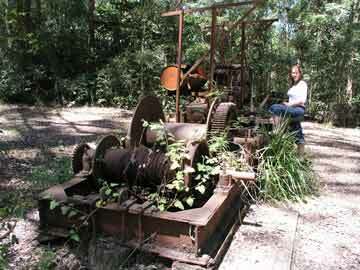 This is in a state forest and there is a nice walk in among the pine trees and we see a lot of birds. We have morning tea before doing the walk. From the picnic area there is a road called Bull Ridge Road which leads south. Two kilometres along this road there is a track off to the right and this goes for 1.8 kilometres till it comes to an end. It is an interesting drive, quite hard, and our average speed is less than 10 kmh. We return back to Bull Ridge Road and go right. 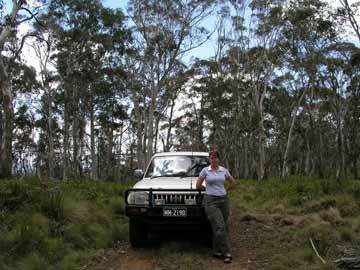 It takes about 22 minutes to travel the 4.5 kilometres back to Barrington Tops Road where we turn left. 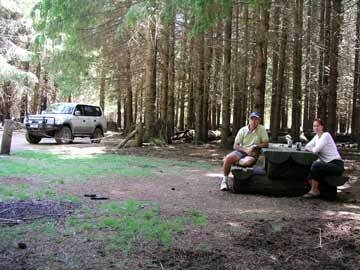 We pass the Firs Picnic Area and a few kilometres along we come to the Moonan Picnic Area. This is on the edge of the plateau and from here there are great views to the west and south-west. We notice here that the temperature has increased but it is still not too bad, but as it is well over 30°C and we are still very high, it is not looking good once we drop down into the Hunter Valley. From here we drop down hundreds of metres to Moonan Brook. We head up the Moonan Brook Road which is where we would have come out yesterday if the track we took had not had a locked gate. This is a very pretty valley but we do not go far as we again strike locked gates. We backtrack and head for Scone. We stop at the Moonan Flats Hotel and it is well over 40°C. We have a beer and a pie for lunch and then head home. It gets hotter, well over 45°C. Lucky we have air conditioning! We get home late in the afternoon. This was a great trip, well worth doing. Even if you do not have a four wheel drive, you can do quite a bit of it, especially the section from Gloucester to Scone. 149.5 litres of fuel costing $146.65, an average of 15.4 litres per 100 kilometres (18.3 mpg). No cost for camping, only other cost was food and drinks.